The call came at dinner time. Jon was just back from work, I was leaving to pick up our order at Chickie’s. The voice was gruff, humorous, tinged with a familiar accent. Uncle Phillip, my mother’s brother, and the repository of my family’s stories. “I know you’re interested in these things,” he says. Something was keeping him up at night, did I have a minute? Of course I did. I rummaged for a pencil and paper. Jon went for the sandwiches. This is what troubles Phillip. In April of 1942, a transport from Vienna arrived in Wlodawa. Three people were settled in the attic room of my grandfather’s house; a mother, a father, a 12-year-old boy, the same age as my uncle. The transport was mostly women and children, Phillip explains. These were the families of German soldiers fighting on the Eastern front–German soldiers who had married Jewish women. Wlodawa was just over the Bug River from Russia. They were told they were being moved closer to the front so that they could be nearer to their husbands. What they didn’t know was that Sobibor was about to become operational. The Nazis had no use for these Jewish women and half-Jewish children. The transport from Vienna became the first Jews to die in Sobibor. This is where history and memory meet. I have read about this transport. But Phillip is telling me details that no website has printed, facts that are not in any book. This is not history to my Uncle Phillip. This is his life. Uncle Phillip knows where, when and how Hans and his mother died. But what is tugging at him, what is keeping him up at night, is what might have happened to the father. The SS took him away some time earlier, probably to question him about the factories, he thinks. Is it possible he survived, is still alive somewhere in the world? I feel a little helpless; I’ve been asked to find the nameless father of a boy named Hans. He’s going to be very disappointed. But, I give it a half-hearted try, punching “Transport from Austria to Wlodawa” into the Google search box. It comes up instantly. Transport 18, from Wien to Wlodawa. It’s right there on the Yad Vashem website. The dates match, April 27, 1942. And then, I see the list of names. A chill goes through me as I realize I’m going to be able to find his friend. All I need to do is find a family of three with a twelve-year-old boy named Hans. And sure enough, there they are, on page three. I stare at it for a minute. It’s not a story anymore. It’s a murdered twelve-year-old boy named Hans Bruell, with a mother named Rosa, and a father named Paul. I click on their names. And then I have their birth dates, their street address in Vienna. At the bottom of the page, where it says Victim’s status at the end of World War II, is the word Murdered. X perished in the Shoah. 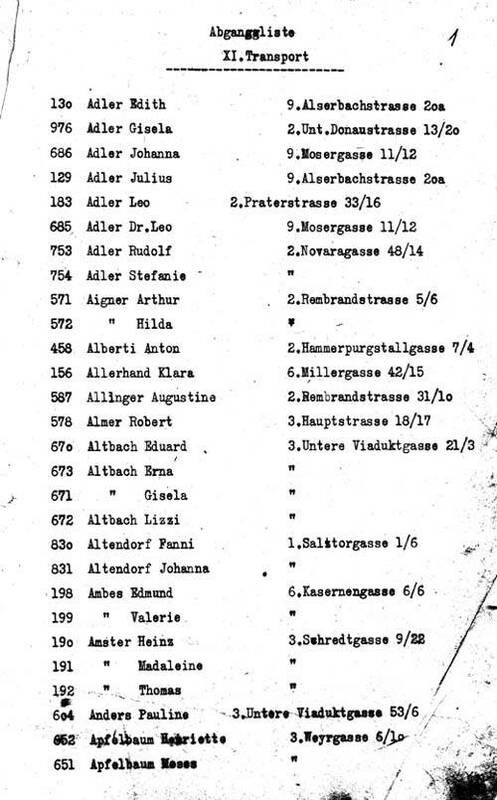 This information is based on a List of murdered Jews from Austria found in the Namentliche Erfassung der oesterreichischen Holocaustopfer, Dokumentationsarchiv des oesterreichischen Widerstandes (Documentation Centre for Austrian Resistance), Wien. Except for Hans’ father, Paul. He died in Majdanek concentration camp, on September 13, 1942, four months after his wife and son perished at Sobibor. Only three people from the transport of 1,000 survived the war, I tell him. I can hear him grieving on the other end of the phone, but I can also feel that it brings him closure of some sort. We say goodbye, and I go back to my messy kitchen and my schedule of laundry and summer camp and car pools. But I am undeniably shaken. For one day, yesterday, the Holocaust leapt out of the text books and became real life.